Who Will Get 300 Saves First? Isringhausen or K-Rod? So with Carlos Beltran pretty much gone and the Mets having almost no shot at the wild card, there’s not much left to watch the Mets for. At least for the rest of the season. Especially since I don’t see a massive fire sale going on. Beltran’s trading may be the last big story for a while. I am curious as to who gets to 300 saves first, Jason Isringhausen or Francisco Rodriquez. Izzy has 296 career saves, KRod has 291. KRod should have more save chances but Izzy is the guy I want to see get to 300 first. Wouldn’t you? So let’s watch this little race to 300 saves. I’m really rooting for Izzy to have a better year than KRod. I feel like Izzy is homegrown talent who’s come home to finish out his career. It may be the only bright spot to the rest of an irrelevant year. If the Mets are out of the hunt, what other milestones will you be watching for this year? Author Dave DoylePosted on July 26, 2011 Categories PitchingTags Francisco Rodriguez, Jason IsringhausenLeave a comment on Who Will Get 300 Saves First? Isringhausen or K-Rod? We’ve been speculating about it for months and it finally happened. The Mets were able to find a team to dump trade K-Rod to. He was quickly closing in on his $17.5 million vesting option for 2012 if he finished 55 games this season. The Mets couldn’t take a chance that the option would vest and they would be stuck with K-Rod at that price next season. We also have to assume that the Brewers were not on K-Rod’s 10 team no trade list in his contract. The Brewers, in all likelihood, won’t use K-Rod to close games and chance that option vesting. The Mets included cash ($5 million) in the deal to help defray K-Rod’s current $12 million salary for this season and the Mets will receive two players to be named later. K-Rod spent two and a half years with the Mets but will be remembered for the ugly incident at Citi Field last year when he assaulted his girlfriend’s father in the stadium after a game. He was arrested and charged with assault and ended up suspended for the rest of the 2010 season. I’m assuming that the Mets will use a closer by committee role for a while until someone in the bullpen establishes themselves. Most likely Bobby Parnell, Jason Isringhausen, and Pedro Beato will get a shot at closing. This is also likely the start of a sale on high-priced players that the Mets will be doing over the next couple of weeks including Carlos Beltran and, possibly, Jose Reyes. Here’s some video from Ken Rosethal of Fox Sports. In his weekly video review of the trade rumors around the league, he leads with a rumor about K-Rod to the Yankees. The Yankees are concerned that Mariano Rivera’s triceps injury is more serious than has been publicized and that Rafael Soriano won’t be able to come back from elbow problems after the All-Star break. Rosenthal says that the Mets have already called the Yankees to gauge their interest in K-Rod. But the Yankees aren’t currently interested in pulling the trigger on a deal. They want to wait until the deadline and would only be interested in a deal that returns next to nothing to the Mets. K-Rod’s going to be a tough sell to any team because of his vesting option next season for $17.5 million. MLB.com reported yesterday that K-Rod agreed to leave his agent Paul Kinzer and hired Scott Boras after meeting with Boras while the team was in LA this week. The Mets have to dump K-Rod on somebody this season. But they don’t have to do it before the non-waiver trading deadline in July. K-Rod would certainly get through waivers in August, so they could do a trade then to move K-Rod somewhere else. But the closer K-Rod gets to finishing 55 games this season and vesting his option for next year, the more difficult a trade will be. The MLB draft in taking place today through Wednesday. It’s a big draft for the Mets, who have the 13th pick in the first round, for a variety of reasons. It’s the first draft for Paul DePodesta with the Mets. He’s Sandy Alderson’s protoge and amateur and minor league expert. The Mets also appear headed toward a rebuilding process so building through the draft is going to be critical. There are several big contracts like K-Rod, Carlos Beltran, and Jose Reyes that the Mets are poised to trade away this season. Combined with the Mets financial problems, building through the draft and farm system would be the likely emphasis for the organization. I’m certainly not an amateur player expert so I wanted to put together some links this morning that would allow you to keep up with the best draft coverage over the next three days. The Mets got a great start from Jon Niese and the bullpen blew the game at the end again. It’s been happening for a week now. The bullpen just can’t hold a lead. Niese was fantastic going 7.2 innings and allowing 2 runs. He had that big curve ball working well and left with a 3-2 lead. Jason Isringhausen was victimized by a critical error by Jose Reyes allowing an easy grounder to go right under his glove. K-Rod got crushed in the ninth inning (but got another game finished toward his vesting option). He gave up 3 hits and a 1 walk in the inning to allow 3 runs. It was a complete disaster of an inning. But K-Rod has been really good this year so it’s hard to fault him for one bad game. The Mets offense was decent with 9 hits and 1 walk in the game but they left 5 runners on base. 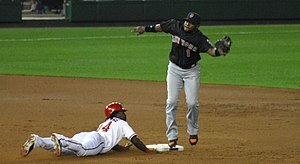 Reyes had his 9th triple of the season and had 2 hits in the game. Do the 2011 Mets have Any Shot At all of Making the Playoffs? Let’s see… Johan Santana may be out for the year, Carlos Beltran is one slide away form blowing out both knees, Jose Reyes is one hard run from blowing out a hammy, and Krod is one fight away from prison. We have a rookie catcher, two pitchers coming back from Tommy John surgery, Mike Pelfrey’s Psychiatrist passed away so the yips may be back, the franchise 3rd baseman has yet to step up and be a leader, an ongoing hole at 2nd base and the team can’t/won’t be spending any money anytime soon. Did I miss something? And let’s not forget the team is owned by the Three Stooges of Real Estate investing (Katz, Wilpon, Wilpon Jr.) who admit knowing nothing about investing and obviously even less about running a baseball franchise. I fully expect MLB to have to step in and take over the day to day operations of the team while it’s owners go through bankruptcy. You think it’s hard to take down a middle eastern dictator? Wait till you see the fight the Wilpons put up to keep the Mets. It’s gonna get ugly! Don’t expect any help from the free agent market either. No free agent hitter in their right mind would want to play at cavernous Citi Field even if we had the money to spend. Pitcher’s looking to prolong their careers may consider Citi Field but are you, the fans, really going to spend your hard earned money to watch a bunch of retreads prolong their careers? Hit up Stubhub starting in June for $1 seats that season ticket holders will be trying to get rid of. So with opening day upon us I proclaim the Mets will finish dead last and the current owners will be fighting well into 2012 to try and hold onto this team. I see little hope for this year and certainly see no hope for 2012 if the Wilpons are still the owners. Although I am seeing a lot of positives coming from the current management team of Collins and Alderson, there are still an awful lot of flaws on this team and something current management can’t control… What happens in the owners box. So do the Mets have a shot at the Playoffs this year? Do you really have to ask that question? Really?!? Author Dave DoylePosted on March 23, 2011 Categories GeneralTags Francisco Rodriguez, Fred Wilpon, Johan Santana, Jose Reyes, Mike Pelfrey8 Comments on Do the 2011 Mets have Any Shot At all of Making the Playoffs? Kerel Cooper of On The Black and I got together for another weekly video to talk about the state of the Mets as the team begins their first full squad workouts. The hot topics of the week are Luis Castillo reporting on time but not early, Carlos Beltran in center field, and K-Rod showing up and apologizing again for assaulting someone at Citi Field last year. The good news is that we don’t have to talk about the Bernie Madoff lawsuit this week!